Robinson Direct is the only advertising and graphic design service in the Lehigh Valley geared toward the specific needs of small and medium-sized businesses. We provide all the services and experience of a big-budget ad agency, but at significantly lower rates. Our one-stop service saves time and money, assures message and brand continuity, and provides you with expert services, start to finish ... one-on-one with the owner. If you are a new business, we can help you create an identity that reflects not only what you do, but your unique personality. And, we can help you plan your product/service offerings, marketing strategies, brochures, ads, promotions, website and more. 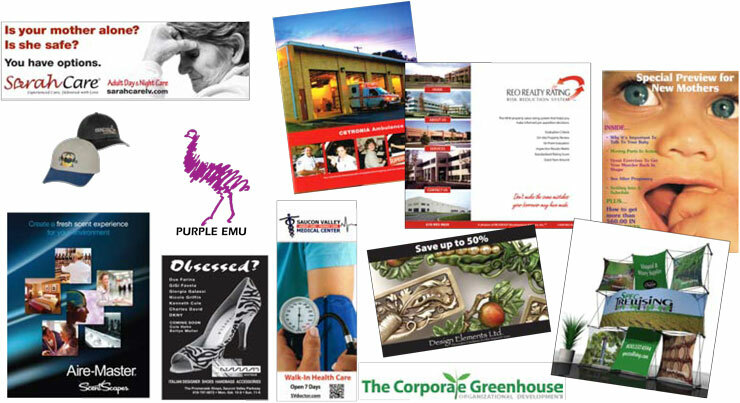 If you are an existing business, we can help you update your image and then create promotions to attract new customers. Either way, Robinson Direct can provide what you need to start and/or promote your business. Take a few minutes to page through the website and see just a few of the ways we've helped clients in fields ranging from emu farms to financial advisers. Then, call today to discuss your needs .... the initial consultation is free.